We have a great option for guests who would love to experience authentic Costa Rican culture, enjoy a great evening of fun, entertainment, food and a beautiful sight from up in the mountains and over looking much of the metropolitan area of San Jose and the Central Valley of Costa Rica. We can offer door to door transfers and guide or you can even drive yourself to the mountain location using GPS. This evening is a half day tour not to be missed during your visit to Costa Rica. The Ram Luna Restaurant's Wednesday or Thursday nights in the mountains overlooking Costa Rica's Central Valley and capital, San Jose, is an event not to be missed when visiting this beautiful country. The Ram Luna Restaurant offers not only authentic delicious Costa Rican cuisine but an elegant atmosphere and an absolutely awe inspiring view of the Central Valley. The sensation of being on top of the world on a clear night with twinkling lights like a giant carpet below in the valley, can only add to deliciously authentic Costa Rican cuisine, dances and music. The Ram Luna Restaurant was the dream of young newlyweds in 1967 who dreamed that one day they would have a restaurant with an elegant atmosphere and delicious food. On Wednesdays, the Ram Luna Restaurant becomes the scene of a traditional Costa Rican celebration called "Tierra Tica", filled with music and dancing, accompanied by an extravagant, delicious and authentic Costa Rican buffet. In addition to the open bar, there are delectable drinks at the buffet table, such as authentic fruit punch and horchata (a sweet, creamy drink made with milk, rice and a touch of cinnamon). For dessert, there's Costa Rica's famous Arroz con Leche, and authentic traditional fudge type candy along with a smorgasbord of sliced tropical fruit. Visitors to Costa Rica don't just head to Ram Luna for its delicious food and beverages, but for the views, and the amazingly beautiful celebration of Costa Rican culture. The marimba is a melodic giant xylophone, and is played together by several musicians. While they play, dancers liven the atmosphere even more with their colorful costumes and joyful exuberance. 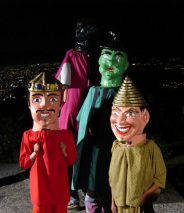 Soon the Cimarrona, a Costa Rican folk dance, appears accompanied by drums and trumpets as well as the giant Costa Rican payaso-clowns. Guests get their chance to join in the dancing, clapping and smiles! To complete the wonderful evening, everyone heads to the patio overlooking the millions of lights of the valley below. Dancers, payasos and musicians together enjoy the final of the show. While there might be sadness to say farewell to everyone, the memories of the experience and the flavors will not be quickly forgotten. A brief visit to see the National Theater at night and a short guided walk around can also be included. In the heart of the capital, the Teatro Nacional shines as an icon of the national pride and liberty of the Costa Rican Republic. Lighted at night, it looks majestic. The Costa Rican Cuisine and Culture Evening combines perfectly with a safe and brief tour to view the National Theater from the street side, with an opportunity to get out and take photos, all at no extra expense to our clients. Can also include transport from your lodging and a stop outside the National Theater in downtown San Jose. Please bring: camera and sweater. Please Note: All tours and prices are subject to change and availability. Scheduling is approximate. The quality of night views of the urban lights depends on weather and currents. The evening tour runs rain or shine. Cancellations can be made before 24 hours of tour for a 75% refund.